On the precinct skirting the outdoor urban screen at The Concourse in suburban Chatswood, the Portals project has set up a virtual nail salon. Two young local manicurists are on hand to paint our fingernails and to install the special accessory that will allow us entrée to the Metaverse. 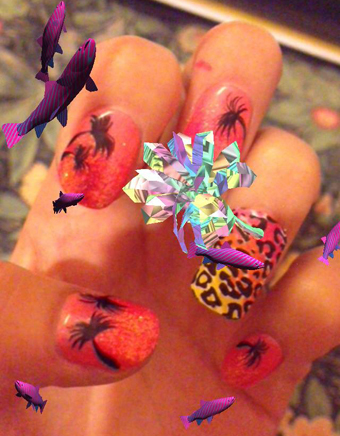 Seated on a couch, we glimpse some possibilities of our augmented reality status as another of the team waves his iPad over our nails to demonstrate their new capabilities: suddenly fish swim from our fingertips, flowers unfold, glowing baubles explode in coloured flashes. Move a finger slowly and a shiny ball will follow. It’s decidedly blingy, but fun. Thea Baumann, Ben Ferns and Shian Law are the creative team behind Metaverse Makeovers. Splitting her time between Australia, Tokyo and Shanghai, Baumann is onsite at Chatswood searching on her iPad for Law who’s in Darwin with Lia Tabrah, the Indigenous fashion designer responsible for the fetching Hologram Hostesses outfits worn by the attendants today—a riotous blend of kaleidoscopic patterns in pink and yellow lycra, worn with platinum or pink wigs. Telematic communication flows wildly in this little corner of an otherwise formal plaza. While a line of high school musicians files into the theatre, Annette Shun Wah’s live interview with Baumann is followed by a blast from Darwin where the team appears to be wrestling a green plastic crocodile. Meanwhile, a pop up reminds us that Julian Assange will address the ISEA multitudes tonight and Creative Producer Ricardo Peach is running us through the other four Portals projects featured this week at the Concourse on his app-packed smart phone. Peach explains that “Distributed Empire [Justin Clemens, Christopher Dodds & Andrew Nash] is a kind of portraiture work where people upload photographs of themselves or their heroes to an app that sends the image into the Distributed Empire network that sources similar faces, morphing yours with others into a new portrait that evolves over time. “The face has changed so much over the last few days. It started off quite realistic and then has become quite abstract. I think it’s become quite cubist at the moment. “You load yourself up, see yourself appear on the big screen and then you morph with other faces. When you go to distributedempire.net you’ll also be able to see other people’s faces who have uploaded themselves onto this sonic, visual sculpture. You can see people taking pictures of themselves here in Darwin and in Sydney…anywhere really. Is Starlight a Wifi Signal? Peach tells us about Is Starlight a Wifi Signal? [Nancy Mauro-Flude, TAS; Nick Smithies, TAS; Crystal Thomas and Frontline Media, NT], a telematic performance between Hobart, Darwin and Sydney. “Nancy was in Hobart creating gestural movements with Crystal in Darwin. It’s a slow piece with a series of images and texts that evolve with [the artists] co-ordinating and working across a network to see how they react to each other while reconfiguring images and messages, including tweets to the stars from the audience via the hashtag #starlight. People in Darwin experienced it very differently from people in Sydney and Hobart. Peach shows us video of intersecting, moving shadows, generated by people passing by a camera or by consciously performing in front of it. 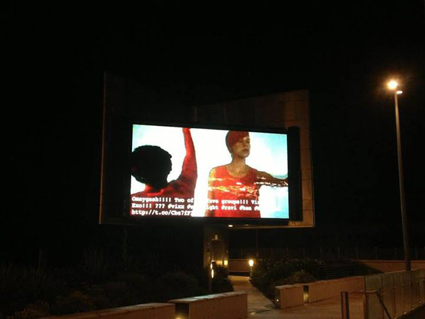 Some are in Sydney, some in Darwin but all are on the big screens in both cities. 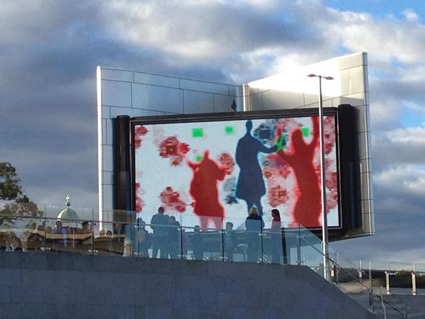 “In Shadow Net by Jimmy McGilchrist (SA, NSW) and Matt Ditton (VIC), people dancing on a green mat in front of X-Box Connects in separate locations appear as shadows onscreen, one blue, one red. They can see each other’s movement. Where their shadows overlap the colours turn green, creating icons [elsewhere on the screen] which when activated by movement generate sound, creating a sonic environment. There’s more of rumba sound if you hit the bottom squares. From what we saw of and heard about The Portals [see also Somaya Langley’s response], it’s clear that its works are very much about realising the expressive power of shared play—with images, sound, data flow and live performance—that can come with experimentation with digital networks across vast distances. This is art-making which doubles as social engagement for participants professional and amateur, and passersby, beyond the limits of conventional discourse.